harmful fumes and gases generated during hot work, including those from surface treatments, such as paint underseal and galvanized coatings. Consideration should be given to all these hazards, particularly when working inside or underneath vehicles (confined areas with restricted personal space). For 'hot work' on wheels see information at our 'Hot work on wheels' page. maintain the welding torch/electrode holder welding current return cables, clamps and safety earths in good condition. Prevent exposure to direct and reflected ultraviolet (UV) light and infrared rays by wearing protective clothing, and using welding screens. If possible, use dark coloured wall coating to reduce reflections. 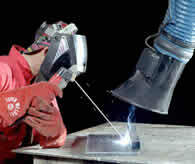 To protect against splatter when welding, wear appropriate clothing that covers arms and legs, and use suitable gloves. Wear goggles when chipping slag or wire-brushing welds during preparation or finishing off work. Specific eye protection including filters for welding operatives (to prevent arc eye) should conform to relevant British and European standards. There are standards covering impact resistance, auto-darkening welding filters and fixed filters. 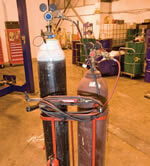 Reputable welding equipment suppliers will be able to assist in the correct choice. Exposure to welding fume is usually infrequent in the MVR environment. However, local exhaust ventilation (LEV) should be used wherever possible and always in confined locations or when welding stainless steel. LEV should also be used when surface treatments, such as paint, paint underseal and galvanized coatings may be affected by heat from welding or flamecutting. LEV such as mobile extraction units with flexible trunking and exhaust hoods can remove fumes and gases from most locations (the hood needs to be located as close as possible to the source of the fume). This LEV should be examined and tested by a competent person every 14 months. For small scale work and where there is no LEV available, then make sure there is a free flow of air (ie good general ventilation - mechanical and/or natural ventilation) to disperse fumes. Never apply heat to containers, tanks or drums that may contain flammable residues. This can result in fatal explosions. All containers must be thoroughly cleaned of all contaminants and purged of all flammable gases before any heat can be applied to them. Alternatively, cold methods of work should be used which avoid the use of heat altogether. Remove adjacent flammable trim and upholstery before carrying out hot work, especially where molten metal or sparks may fall onto them. Check that fuel lines and tanks will not be affected; empty and remove any which are near or shield them. Check that body cavities next to welding or flamecutting are not filled with plastic foam, which may be easily ignited. Remove this where necessary and use a heat shield to protect adjacent areas. Spot welding tends to be a more controlled process and produces much less fume and splatter and negligible UV. Eye protection is only required to safeguard against splatter and good general ventilation is usually sufficient. All portable welding guns should have suitable counterbalanced devices for supporting the guns, including cables, unless the design of the equipment makes counterbalancing unnecessary. only allow trained, competent people to use the plant. where flammable gas cylinders are transported for roadside or on-site repair, they should be transported in a well-ventilated (preferably open-topped) vehicle, secured in an upright position, and with both the cylinder and blowpipe valves turned off. 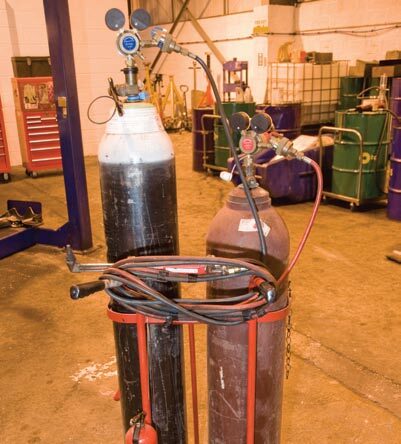 A garage was prosecuted by a local authority in 2012 following an investigation after an employee attempted to hot cut a drum containing car engine oil which then suddenly exploded. Fortunately, in this case the employee survived - often this is not the case. The company owning the garage were prosecuted and fined a total of £40K and paid costs of nearly £17K at magistrates court. The CCTV footage from the garage showed how this occurred - follow this link 'Hot cutting an oil drum containing residual vapour' - the important message here is don't carry out hot cutting without considering the risks involved and the precautions needed.